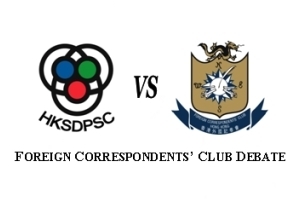 The high-achieving student team representing the Hong Kong Schools Debating and Public Speaking Community (HKDPSC) emerged the winners of a excellent and tough public debate against The Foreign Correspondents’ Club’s (FCC) team. The HKDPSC team comprised of Natalie So, James Lo and Benjamin Allen. Representing the FCC were SCMP business editor Nick Edwards, Bloomberg reporter Rachel Evans and barrister Kevin Egan. The two teams faced-off on the motion that ‘This house believes that the growth of social media is the single biggest challenge facing journalism today’ with the HKDPSC team affirming the motion and the FCC team in opposition. Before the debate, the audience voted 40% in favour, 39% against and 21% undecided. After a spirited debate from both sides, the audience voted 54% in favour and 43% against, giving the HKSDPSC team the win. Thanks U R number ..
371,411 HIT SO FAR - STAY TUNED! Enter your email address to subscribe to HKSDC and receive notifications of new posts by email.